The National Weather Service says, “Florence will continue to weaken while it accelerates northeastward across the Mid-Atlantic and New England through Tuesday. Heavy rainfall remains possible in the Northeast states. In the wake of Florence, prolific river flooding will remain a long-term concern in parts of the Carolinas and southern Virginia Nearly 36 inches of rain has fallen over Elizabethtown, North Carolina, reports CBS Raleigh affiliate WNCN-TV. 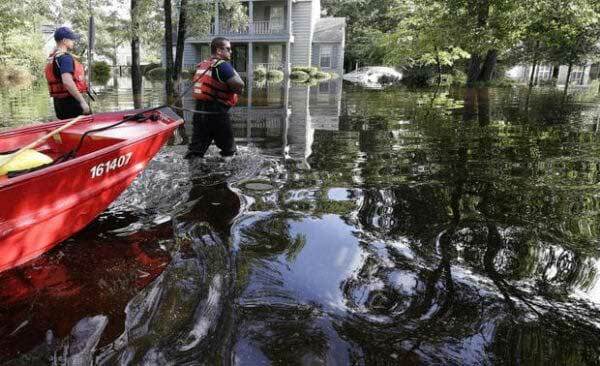 With one of North Carolina’s largest cities, Wilmington, still mostly cut off by floodwaters from what was Hurricane Florence, officials prepared to begin distributing food, water, and tarps to residents as yet more people were rescued from submerged inland neighborhoods. Workers were to begin handing out supplies to stranded residents in the city of 120,000 people Tuesday morning, county officials say. One road was opened into Wilmington at least briefly, officials said, and items have been brought into the city by big military trucks and helicopters, which also have been used to pluck hundreds of harried people from atop homes and other structures. The rain finally stopped and the sun peeked through, but North Carolina Gov. Roy Cooper warned that dangerously high water would persist for days. He urged residents who were evacuated from the hardest-hit areas to stay away because of closed roads and catastrophic flooding that submerged entire communities.”There’s too much going on,” he told a news conference. Crews have conducted about 700 rescues in New Hanover County, where Wilmington is located. More than 60 percent of homes and businesses were without power, authorities said. Roads are being cleared and the landfill is open to accept storm refuse. Mayor Bill Saffo said he was working with the governor’s office to get more fuel into Wilmington. “At this time, things are moving as well as can be in the city,” he said. Compounding problems, downed power lines, and broken trees crisscrossed many roads in Wilmington three days after Florence made landfall. The smell of broken pine trees wafted through damaged neighborhoods. Floodwaters from recent hurricanes Floyd and Matthew came close to entering Joe Holmes’ house in South Carolina, but he dodged those bullets. Now, with Florence, he doesn’t feel so lucky. He worries the Waccamaw River will make its way into his Conway home because the state wants to save the main highway into Myrtle Beach, a more densely populated city and tourist destination, from going underwater. Officials insist they must keep the road open, or hundreds of thousands of people would be isolated. So the state is building a higher wall – in the form of the second level of concrete highway barriers on top of the sides of 1.5 miles of bridges and causeways, sealing them with plastic sheets weighed down with sandbags and rebar – in its last stand on U.S. Highway 501. Skeptical Conway residents fear this will push water into their neighborhoods, but officials say it won’t affect any areas that weren’t already doomed to flood – at least not in the models they’ve run. The Waccamaw River – which winds through Conway – was already in a major flood at just over 15 feet Monday, according to the National Weather Service. The city had received 16 inches of rain from Florence’s slow march inland, and homes were already threatened. By Friday afternoon, the river should top the record of 17.9 feet, set just two years ago in flooding from Hurricane Matthew. And it won’t stop there. By Saturday, the river should be at 18.7 feet. Conway officials say they’ve been told to expect the river to rise up to an additional 2 feet after that, which would flood nearly 1,000 homes. CBS News has confirmed 32 deaths are being attributed to the storm as of Monday evening: Twenty-five in North Carolina, 6 in South Carolina and 1 in Virginia. Among the dead were Lesha Murphy Johnson, 41, and her 7-month-old son, who died when a tree fell on their house in Wilmington, North Carolina. Two other children who were killed were Kaiden Lee-Welch, who officials say was swept away in rushing waters from Richardson Creek in Union County, North Carolina, and Kade Gills, 3 months, who officials said died when a tree fell on a mobile home in Dallas, North Carolina. A group of volunteers all too familiar with devastating flooding have gone to North Carolina to help in the aftermath of Florence. Cajun Navy Relief and Rescue is a non-profit group of volunteers from across the country. The group was created after flooding hit southern Louisiana in 2016. CBS News was with the team in Lumberton as they evacuated 40 people from Highland Acres Nursing and Rehabilitation Center. Many of the residents were bedridden. “Yeah, we are risking our lives, but this is worth it,” said Chris Russell, one of the volunteers. It took five hours to rescue the residents and deliver them to area hospitals. I think what we were able to accomplish tonight, was to give these people some dignity, holding their hand, asking them if they would like to somebody to pray with them,” said Allen Lenard, another volunteer. “As much as I believe were a blessing to those people, I know as a matter of fact, that they were a blessing to me tonight.” The city has a history of flooding. Two years ago, Hurricane Matthew dumped 20 inches of rain on Lumberton. Dramatic rescues have become a common sight after storms across the country. Last year, CBS News saw volunteers go out in Houston in the aftermath of Hurricane Harvey. Other “Cajun Navy” volunteers became famous for helping to rescue people trapped by floodwaters in the wake of Hurricane Katrina. The makeshift flotilla is credited with rescuing more than 10,000 people from flooded homes and rooftops. Florence, which made landfall as a hurricane, is blamed for at least 24 deaths. About 500,000 homes and businesses are still without power in North and South Carolina. Since the storm continues to cause heavy rains, flash flooding is still a concern over the Carolinas. North Carolina environmental regulators say several open-air manure pits at hog farms have failed and are spilling pollution. Department of Environmental Quality Secretary Michael Regan said Monday that the earthen dam at one hog lagoon in Duplin County had been breached. There were also seven reports of lagoon levels going over their tops or being inundated in Jones and Pender counties. Regan said state investigators will visit the sites as conditions allow. The large pits at hog farms hold feces and urine from the animals to be sprayed on nearby fields. The Associated Press published photos of a hog farm outside Trenton on Sunday where a waste pit was completely submerged under floodwaters. N.C. Pork Council, an industry trade group, later denied there had been any reports of spills. North Carolina’s top law enforcement official is looking into hundreds of complaints alleging price-gouging in the wake of Hurricane Florence. Attorney General Josh Stein has received about 500 complaints so far alleging price-gouging for essentials like gas and water, his office said Monday. Most of them were in the eastern part of the state, and investigations of some gas stations have already begun. About 20 percent of gas stations in the state are without gasoline as of Monday morning, GasBuddy reported, while 10 percent are without power. In South Carolina, 9 percent of stations were without gas. Other stations have extensive lines of cars waiting to fill up, according to reports on social media. However, Patrick DeHaan, head of petroleum analysis at GasBuddy, said the popular app has not received any reports of gouging. “To date, we have not received a single photo of receipts or signs showing far above average prices,” he said. Preparation for Hurricane Florence drove up gas prices by 5 cents a gallon in South Carolina, 3 cents in North Carolina and 1 cent in Virginia, according to AAA. But they have remained relatively stable, and the statewide prices for South Carolina and Virginia even today put them among the 10 cheapest states for gas. “The situation will likely take time to improve but the good news is that fuel supply has not stopped flowing,” GasBuddy analysts said in a note. In the last 36 hours, CBS News has seen hundreds of rescues, evacuations and road closings up and down the swollen Lumber River. Pembroke police rescue commander Matthew Locklear said an ambulance flooded and they had to “evacuate ourselves.”This a monumental disaster for our state,” said North Carolina Gov. Roy Cooper. “In many parts of North Carolina, the danger is still immediate.” Florence transitions to a post-tropical cyclone Forecasters said Florence has transitioned into a post-tropical cyclone that still carries heavy rains and gusty winds. Florence has become an increasingly elongated low-pressure area that’s still producing heavy rain over parts of the Mid-Atlantic, according to the National Weather Service’s Weather Prediction Center. By 5 p.m. Monday, the system had top sustained winds of 25 mph. It was centered about 85 miles west-southwest of Morgantown, West Virginia, and moving east-northeast at 14 mph. Forecasters said catastrophic flooding continued Monday in the Carolinas, and flash flooding and tornado risks were expected as far north as Pennsylvania. About 60 children in state custody along the coast of North Carolina have been evacuated to a YMCA conference center in the western mountains. The Boys and Girls Homes of North Carolina chose to evacuate its residential center in Lake Waccamaw on Wednesday. They had hoped to return on Monday, but their facility is about 40 miles west of Wilmington and has been hit with heavy flooding, damaging a few buildings. Vice President Tom Huggins said they hope to return on Thursday. A mission to observe flooding in northeastern South Carolina has turned into a rescue mission after Gov. Henry McMaster spotted a pair stranded on a flooded vehicle. McMaster was touring portions of Chesterfield County in a National Guard helicopter on Monday when he spotted two people lying down on a vehicle nearly completely submerged in rushing floodwaters. Sheriff Jay Brooks radioed to the ground to dispatch a rescue crew. A few moments later, McMaster asked Guardsmen to land the chopper to observe the rescue. On the ground, he watched as the two people safely got into a rescue boat and flashed him a thumbs up. McMaster says officials in this area have told him local water sources in this area are nearly 10 inches (25 centimeters) higher than normal. Officials expect as much as a foot more as river basins absorb more water flowing into the state from North Carolina following Florence’s torrential rains. A tornado has touched down just outside of Richmond, Virginia — at least the second tornado to hit the state as the remnants of Hurricane Florence passes through. The National Weather Service tweeted that a confirmed tornado was on the ground in Chesterfield County Monday afternoon. There were no immediate reports of damage or injuries. The county school system said all students in county schools were sheltered in place. The Virginia Department of Emergency Management said earlier that a tornado damaged three properties in Mecklenburg County, which is near the border with North Carolina. An economic consulting firm says Hurricane Florence may result in between $17 billion and $22 billion in lost economic output and property damage. That would put Florence in the Top 10 of costliest hurricanes to hit the U.S. Economists at Moody’s Analytics caution that this estimate could be revised significantly higher as more information comes in on the extent of inland flooding. The consulting firm says it is putting property losses at between $16 billion and $20 billion and lost economic output at between $1 billion and $2 billion. The total cost of hurricanes has been rising because of increased construction in coastal areas and more severe flooding associated with rising sea levels. Trump says officials won’t rest until “job is done” President Trump says his administration “will not rest” until the “job is done” in the aftermath of Hurricane Florence. Mr. Trump is offering his thoughts to the people of North Carolina, South Carolina, Virginia and everyone else who has been affected by the storm. Speaking to reporters at the White House, Mr. Trump said 20,000 federal personnel have been deployed. He said they are “putting their lives on the line.” Florence is being blamed for at least 20 deaths in North Carolina and South Carolina. The storm has left about 500,000 customers without power, most of them in North Carolina.